The presence of granular igneous rocks at the base of Mount Rainier was first mentioned by Lieutenant Kautz in 1857 and again, in 1870 Emmons (7) observed ".... a beautiful white syenitic granite rising above the foot of the Nisqually Glacier." Since then, numerous other masses of similar rocks have been encountered in the Cascade Range. Most of these, however, differ in age and are in no way related to the granodiorite in the Park. An exception is believed to have been found in the Snoqualmie granodiorite, first described in the quadrangle bearing the same name. The Snoqualmie granodiorite invades the Keechelus series in a manner identical to the plutonic masses surrounding Mount Rainier. Both are essentially granodiorite, a term described by Lindgren (20) thirty years after Emmons' visit to the mountain. 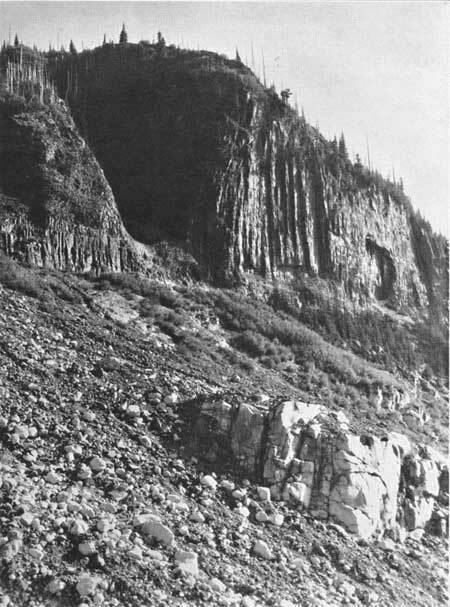 The outcrops in the Park are to he explained by the effectiveness of the glaciers in cutting through the overlying Keechelus and bringing to light portions of the granodiorite below. An irregular F-shaped exposure occurs along the northern face of the Tatoosh Range with prongs extending up the Paradise and Nisqually rivers. This mass is well-exposed along the tortuous highway leading from Longmire to Paradise and on the Reflection Lake branch. The longest expanse of granodiorite in the Park roughly follows the White and Klickitat rivers, extending from their sources to approximately 1 mile north of the old White River entrance. Beautiful exposures of this mass are to be seen along the Chinook Pass Highway and the Yakima Park road. 1. White River Park near Hidden and Clover lakes. 2. Below St. Elmos Pass on the Winthrop side. 3. Garda Falls on Granite Creek at the terminus of the Winthrop Glacier. 4. Goat Island rock and adjacent territory on either side of the Carbon Glacier. 5. Chenuis Falls at the junction of the Carbon River and the north boundary. 6. The foot of Ranger Creek across the Carbon River from Chenuis Falls. Many other and smaller patches of granular igneous rocks are to be found in the Park. Because of their limited extent, hybrid nature, and intimate association with the Keechelus, these rocks have been included in the latter formation, following the precedent set in the Snoqualmie folio. As the glaciers have merely scratched the surface of this batholith, few localities exhibit a clear-cut and homogeneous granodiorite. Rather, the types so often met with are immediately below the contact with the Keechelus and contain swarms of xenoliths and other, more diffused, material. This tends to impart a darker color and a more hybrid appearance than is usually characteristic of the deeper portions of the granodiorite. At the White River and the Nisqually localities, the rock is relatively homogeneous, except for a few small aplitic and hornblendic dikes. Here, the grandiorite is a medium-grained aggregate of milky-white feldspars; colorless, glassy quartz; lustrous black biotite and hornblendeall easily distinguishable megascopically. The strong contrast between the white feldspars and the black mafics gives the rock a very pleasing appearance when cut and polished. Microscopical Petrography. The rock has a hypidiomorphic granular texture. In addition to the minerals listed above, magnetite, titanite, and apatite are present, as well as a small amount of sericite and calcite in minute cracks in the feldspars. As a whole, the minerals are clear and fresh. The idiomorphism of the soda-lime feldspars, so common in the Cascade batholiths, is well displayed in this granodiorite. Without exception, the plagioclases show strong oscillatory zoning with relatively more acid rims. The composition varies from andesine (Ab65-An35) in the cores, to oligoclase (Ab80-An20) in the rims. The biotite is of the siderophyllite variety with Ng and Nm=1.650 and a 2V of less than 20. Pleochroism is marked with X yellow, Y, and Z greenish-brown to opaque. A clear, green rim of a chlorite surrounds the biotite as an alteration product. The hornblende is decidedly greener than the biotite and varies from pale yellow (X) to green (Y) to dark green (Z). The orthoclase is exceedingly fresh and, especially when the section is cut parallel to 010, it becomes increasingly difficult to distinguish from the quartz. The optical character of each had to be checked while estimating the percentage composition. Both orthoclase and quartz are anhedral and their interstitial position and inclusions indicate they were the last minerals to crystallize. The accessories are limited to titanite, magnetite and apatite. The magnetite forms grains 0.3 mm. in diameter and, together with the smaller wedges of titanite, are always associated with the hornblende and biotite. While the euhedral prisms of apatite have not been so selective in choosing their host, they seem to favor the feldspar and quartz. The composition, based on 15 specimens from the Nisqually and White River localities, is as follows: plagioclase, 54 per cent; quartz, 18 per cent; orthoclase, 10 per cent; biotite, 8 per cent; hornblende, 5 per cent; magnetite, 2 per cent; chlorite, 1 per cent; apatite, 1 per cent; and, sericite, calcite, and titanite make up the remaining 1 per cent. Although the more basic phases of this mass grade into diorite and quartz diorite, the composition as given above, of this homogeneous facies, falls well into the granodiorite class as defined by Lindgren. The granodiorite invades both the Keechelus and the Guye formation; the relation being abundantly proved by a great number of contacts seen in the Rainier district, the Snoqualmie quadrangle, and the northern portion of the Mount Aix quadrangle. In the northeastern corner of the Park, the contact is characterized by a xenolith zone some hundreds of feet in thickness. Well-exposed along the road leading from the White River bridge to the old Starbo camp, and also at Hidden Lake, for the hurried Park visitor this interesting contact may be seen to best advantage on the Chinook Pass Highway between the junction of the Yakima Park road and Ghost Lake. The writer (14) has examined the granodiorite-Guye contact several times in the Snoqualmie quadrangle, and there is no doubt as to the relative ages of the two formationsthe granodiorite is definitely younger. Since the age of the Guye has already been established (?) as Miocene, then the lower age limit of the granodiorite must be post- or late Miocene. The uppermost limit must be set as pre-Pleistocene as the granodiorite is overlain, unconformably, by the Pleistocene, or perhaps Pliocene, lavas of Mount Rainier. The best example of this uncomformity is seen at the snout of the Nisqually Glacier on the southeast side of the river. This would confine the invasion of the batholith either to late Miocene or Pliocene time. In view of the fact that considerable erosion has taken place since the emplacement of the batholith, it seems more plausible to establish the time of the emplacement to as old a date as possible. From present data, this is necessarily limited to late Miocene.